After being abducted in Belarus, this Ukrainian citizen is facing terrorism charges in Russia. 23 July: Pavlo Hryb. Source: Iryna Romaliiska, Hromadske Radio. On 23 July, the Russian authorities began the trial of Pavlo Hryb, a 19-year-old Ukrainian citizen who was abducted from Belarus by Russian security services. 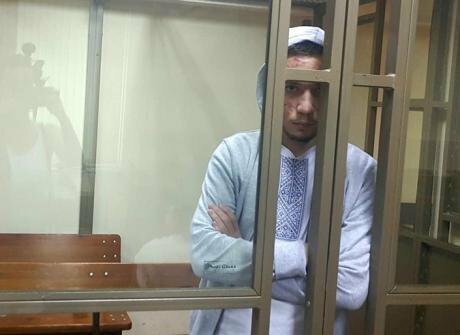 After 11 months of psychological pressure, Hryb, now 20, is facing trial on fabricated terrorism charges in one of the most absurd cases among the roughly 70 Ukrainian citizens who have been illegally detained in Russia and annexed Crimea. In late August 2017, Pavlo Hryb travelled to Gomel, Belarus, to meet a 17-year old girl by the name of Tanya. This was supposed to be their first real date after months of chatting online: he was from Ukraine, and she was from Russia. Immediately after the date, Pavlo went missing. As Hryb walked to the bus station in order to travel back to Kyiv, unidentified people bundled Hryb into a dark minivan and took him across the border into Russian territory, where he was formally charged with terrorism offences. Allegedly, he had incited a person (in this case, Tanya) to terrorist activity. “The Russian border service says that Pavlo didn’t cross the border. But he was arrested in Smolensk Oblast. How could this happen? The fact that he wasn’t charged with illegal border crossing means that he was transported by law-enforcement agencies,” says Marina Dubrovina, Hryb’s attorney. Two weeks after Hryb’s detention, the Russian Federal Security Service (FSB) notified the Ukrainian general consulate in Rostov-on-Don that Hryb was in detention in Krasnodar, southern Russia. This was a clear violation of the Consular Convention between Ukraine and Russia: the Russian state should have informed the Ukrainian consulate within three days after arrest. On 23 July 2018, the North Caucasus District Military Court of Rostov-on-Don, Russia, was supposed to start the first court hearing in Hryb’s case. Instead, the court referred the case back to the prosecutor – an old version of the terrorism offence had been indicated in the indictment against Hryb – and extended Pavlo’s detention further. The new version of the offence carries ten years of imprisonment instead of eight. The court case against Hryb is built on excerpts of private chats between Pavlo and Tanya via Skype. According to the FSB, Hryb sent Tanya, a resident of the Krasnodar town of Adler, instructions on how to make an explosive device – and incited her to allegedly plant the bomb on the last day of school on 30 June 2017. The role of Tanya in this case raises many questions. Some believe that she is an FSB plant, and others – a troubled teenager who was taken advantage of by Krasnodar FSB. In her conversations with Pavlo, Tanya expressed pro-Ukrainian views. They discussed Ukraine’s struggle for independence, Roman Shukhevych and Stepan Bandera, leaders of Ukrainian nationalist forces during the Second World War, as well as the ongoing war in eastern Ukraine. By all accounts, Tatiana seems to have been very interested in Ukraine, claiming to have taught herself to write and speak Ukrainian. Tanya was going to move from Russia to Ukraine, to live with Pavlo, she told him. In July-August 2017, she was extremely insistent on meeting in Belarus since Pavlo resolutely refused to travel to Russia. Tanya. Source: Hromadske Radio. Tanya seems to have been and continues to be under pressure from the Russian security services. In June 2017, she applied for a foreign passport. A few days later, she claims to have been taken for questioning by the FSB, together with her mother and teacher, where she was told her online correspondence with Pavlo was under control of the FSB. Tanya also claims that the FSB promised to issue her a passport if she discovered Pavlo’s future plans during their meeting in person. In July 2017, the family’s apartment was also searched – and the correspondence between the two young people was confiscated. Pavlo initially confessed to the terrorism charges, believing he was helping Tanya – though he retracted this statement when he saw Tanya’s testimony against him. This was when the the FSB started to pressure Hryb psychologically, in violation of his rights. “They can’t pressure him physically because of his rare illness, so they use psychological methods,” Olha explains. Since being detained in August 2017, Pavlo hasn’t received any correspondence from parents. In July 2018, Hryb was beaten by a guard and other prisoners during his transfer from Krasnodar to Rostov-on-Don. Due to the terrorism charges, he has been prevented from receiving postal money transfers – in order to buy food, medicine and other provisions. There have even cases when Hryb wasn’t allowed to receive food sent by his parents. Hryb suffers from a rare illness called portal hypertension. There is no cure apart from surgical implantation of artificial blood vessels – but Hryb still needs medication to keep his body functional. This was most likely an unexpected complication for the FSB: Pavlo made no mention the chronic disease in his Skype conversations with Tanya. More pressingly, Hryb hasn’t received medication for this condition since January 2018. The Russian authorities have refused to permit Ukrainian doctors to visit him despite demands by the European Court of Human Rights. No such specialists are available in Rostov or Krasnodar. Pavlo Hryb. Marina Dubrovina states that the prison doctor now seems to allow medication for her client, but it should be Russian and bought in Russia, which means that the Hryb family must find local substitute medicines. Dubrovina admits that Pavlo was finally allowed to receive money via bank transfers. “The Kremlin aims to create a big media story on how it is defending its citizens from terrorism and so-called Ukrainian Nazism. They are intentionally looking for people suitable to make into a terrorist, extremist or spy story,” says Oleksandra Romantsova, a human rights activist from the Center for Civil Liberties NGO. These kind of “spy stories” can be aimed at Ukrainians too. “They have to demonstrate that you can end up in the same situation as these people, illegally detained and imprisoned, for what you write on social media,” Olha Hryb, Pavlo’s sister, tells me. In the eyes of the FSB, Hryb – an active social media user – seems to have been suitable for this purpose. For instance, Hryb’s nickname on VKontakte, a popular Russian social network, was “Roman Shukhevych”, a prominent Ukrainian Insurgent Army commander from the 1940s. During the 23 July hearing, the prosecution offered new information, stating that Hryb had planned the alleged school attack on the orders of Stefan Kapinos, a member of the Ukrainian National Assembly-Ukrainian People’s Self Defence (UNA-UNSO) organisation, a Ukrainian far-right group that Russia considers extremist. According to the defence, Hryb and Kapinos both had password access to the same online account. The Ukrainian state needs a comprehensive strategy for assisting citizens who have been illegally detained and imprisoned in Russia or annexed Crimea. Many families don’t have the financial resources to hire a lawyer in Russia, and the legal status of these prisoner isn’t clearly defined either. Amnesty International, an international human rights group, cannot monitor every case closely – instead focusing on certain cases and drawing attention to the problem as a whole. The EU, the European Parliament, PACE and US State Department have all issued statements of concern or demands for the release of Ukrainian prisoners held in Russia.